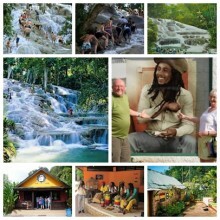 Welcome to Dunn's River Falls, one of the most amazing attractions in the world. It is also one of Jamaica's national treasures. Globally, it is as well-known as reggae and equally as stimulating. Whether you're a first time visitor or not, this attraction will provide a truly authentic Jamaican experience filled with exhilarating climbs, refreshing pools with 'massage parlors' and some of the most beautiful scenery to be found. 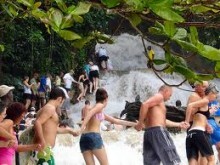 Visitors enjoy climbing the falls hand in hand, led by experienced falls guides. If you are not that daring, then you can view the activities from a safer vantage point on the terrace or deck. The falls climb to over 600 meters, and provide a refreshing flow of water, ending in a gentle cascade into the Caribbean Sea. 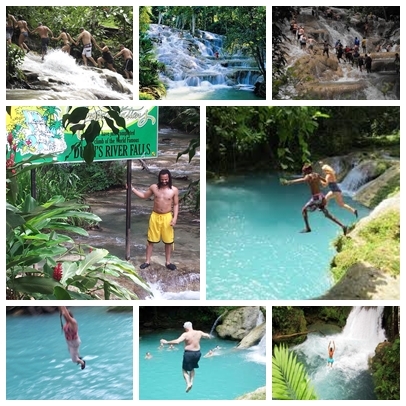 The cool Blue Hole Water Falls is rated as the #1 attraction in Ocho Rios on TripAdvisor. This 20ft cascading waterfall is a hidden treasure waiting to be discovered. The blue misty water is deep enough for an exciting cliff jump and also diving. This enchanting attraction also has a Tarzan swing rope which makes the Blue Hole fun and excitement for all. Our tour customer support specialists are always ready to assist you. Please contact us or call to speak to a tour specialist.